Obituary for Rita A. Lenhart | Rhoney Funeral Home, Inc.
Rita A. Lenhart of Fairfield, CT, passed away peacefully on February 12, 2019. Rita was born in Chicago on July 7, 1932 the daughter of the late Anna (Derus) and Melvin Caldwell. After graduating in 1954 with a Bachelor of Science degree in Nursing from Niagara University, Rita pursued an exceptional Nursing career while obtaining her Masters of Education degree from SUNY, Buffalo, and a Masters of Arts in Nursing Administration from Teachers College at Columbia University in New York. She also earned a Post-Masters Nurse Practitioner Certificate from Boston University. 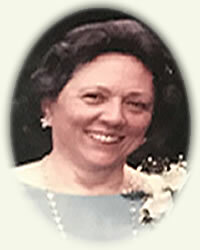 During a career spanning 50 years, Rita was a Staff and Charge Nurse in the Operating and Emergency Rooms at Emergency Hospital in Buffalo, NY, then an Assistant to the Dean of the Indiana University School of Nursing, and then was the Team Coordinator for Baccalaureate Med-Surg Nursing at the University of Bridgeport. In 1975, Rita was inducted into Sigma Theta Tau, Alpha Chapter, the national honor society for Nursing. In 1978 Rita became a Certified Nurse Practitioner in private practice with a Physician’s Office in Fairfield, CT. In 1980, she was a Staff Development Instructor at the U.S.V.A. Medical Center, in West Haven, CT and in 1984 received a Joint Appointment to the Faculty at Yale University. In 1987 she became the Assistant Director of Nursing for Education and the Hospital of Saint Raphael in New Haven, CT, and in 1989 became the Director of Nursing at the North Fairfield Geriatric Center in Fairfield, CT. Upon the retirement of her husband from Union Carbide in 1990, Rita became the Director of Nursing at the Browning Long-Term Care Center and retirement home in Waterville, OH where she was named Director of Nursing of the Year. In 1992, Rita became a Surveyor II for the division of Health Facilities Regulation for the State of Ohio, leading to her last position as Field Representative for the Joint Commission on Accreditation of Healthcare Organizations and long term care facilities, performing Life Safety Code inspections. Rita was an inspirational role model, the seamstress of handmade clothing for family vacations in the 60’s & 70’s, volunteering for Cub and Boy Scouting & Brownies and Girl Scouting, insisting on music lessons and other activities for all her children, and she possessed a passionate devotion to the Catholic Faith. She was also a world class shopper, never finding an outlet she didn’t like. Rita was the loving and devoted wife of John Edward Lenhart, Sr. for 56 years, he having passed in January, 2012. She shared her husband’s love for baseball, visiting 47 minor league ballparks during their retired years. She is survived by her children John E. (late Deborah), Jr., Daniel (Jill) , Judith (Coy) George, Jennifer Broadbin and Catherine Magi, a son in law Donald Butkuss, nine grandchildren, Michael Butkuss, Thomas and Kevin Lenhart, Mathew Marrash and Kristen Laudenslager, Blythe and John Broadbin, Jr., Edward, Jr. and Nicole Magi, one great granddaughter, Courtney Marie Laudenslager, also by lifelong friends Margaret (Peggy) Houck and Deloris (Dolly) Gay and a beloved niece Annette Lenhart. Rita was the mother of the late Marie Lenhart-Butkuss and grandmother of the late Jacquelyn Lenhart. There will be no prior visitation. A private Mass of Christian Burial will be held at St. Mary’s Church in Niagara Falls, NY. Entombment will follow at St. Joseph’s Cemetery in Niagara Falls alongside her husband. In lieu of flowers, the family requests that donations be made in Rita’s name to the Muscular Dystrophy Association and/or the American Cancer Society. Please sign-in to the Guest Register at: www.rhoneyfuneralhome.com.